Co-Optimus - News - Our Weekend in Gaming - One Week Closer to PAX! 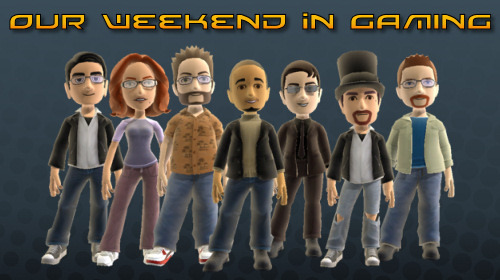 Our Weekend in Gaming - One Week Closer to PAX! We're exactly three weeks away from PAX - and the staff can't wait! Nick "bapenguin" Puleo - "Hopefully playing some MadBalls, as well as Company of Heroes: Tales of Valor. Been playing a bit of Shadow Complex on XBLA as well and hope to finish that up for a review!" Marc "DjinniMan" Allie - "Rock Band 2 and GH Smash Hits should get some play, now that we've fixed the drums. I'm intrigued by the Batman Arkham Asylum demo, too. Other than that, more 'Splosion Man and hopefully more co-op Duels of the Planeswalkers." Katrina "ShadokatRegn" Pawlowski - "This weekend will probably include a bit of single player gaming; Fallout 3 or Mass Effect beg to be finished. There's also a good chance I'll be down for some Madballs to finish up that BDI campaign!" Mike "pheriannath" Katsufrakis - "In preparation for our upcoming Co-Op Night, I've started playing through Halo 3 again. If I have time, I might invest a little time into Marvel vs. Capcom 2 and perhaps a little Street Fighter IV." Jason "OrigamiPanther" Love - "I'm taking a trip to see the folks' this weekend and won't be bringing any games along. It's a game free weekend for me!" Jim "txshurricane" McLaughlin - "There are several Arcade titles that I need to heavily consider buying, namely Turtles in Time, Trials HD, and 'Splosion Man. Other than that, I'll be getting my Battlefield fix with Bad Company and BF 1943, and whatever else I get invited to play." Loren "AgtFox" Halek - "Going on vacation AND my 360 red ringed yesterday, so no bringing it with to play games. Maybe play some Wii co-op/multiplayer games with the family during the vacation. Probably play some long negelcted PSP and DS games as well." Page created in 0.5666 seconds.